Nicolai Ivanovich Fechin was born in Kazan, Russia on Nov 28, 1881. Fechin’s early art training came from his father who was a wood and metal craftsman, gilder and icon maker. He received a scholarship to the Kazan Art School at the age of 14 and at 19 entered the Imperial Academy of Fine Arts in St. Petersburg, where he studied with and was greatly influenced by Ilya Repin. In 1909 he graduated with the highest grade possible and his final competitive canvas won him the Prix de Rome, which allowed him to travel and study in Europe. After returning to Russia, Fechin taught at the Kazan Art School, eventually becoming its director. Fechin began exhibiting in America in 1910, and two years later he started participating in the Wanderer’s Exhibitions throughout Russia. In 1923, following several years of deprivation during the Bolshevik Revolution and World War I, Fechin immigrated to the United States with his wife Alexandra and baby daughter Eya. He was already well known in the States from canvases sent to American and European exhibitions. His portraits were immediately in demand and he won the first prize at the Academy in New York in 1924 and a medal at the 1926 International Exposition in Philadelphia. In 1927 a bout of tuberculosis forced Fechin to move to Taos, New Mexico. Taos proved a fertile ground for Fechin’s art. 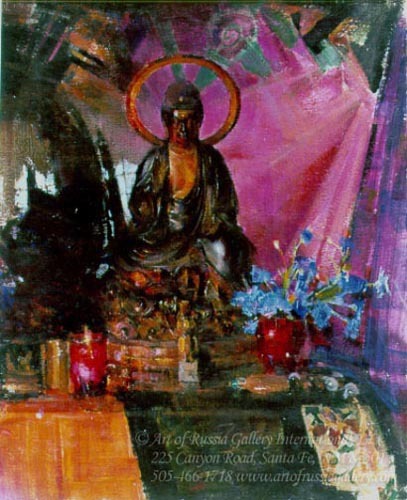 He soon painted with fervor and felt a particular affinity with the Taos culture. His greatest American works were of the Native Americans. Fechin had great affection for New Mexico, which reminded him of the places around Kazan where he spent his childhood. The house he built for himself and his family in Taos remains one of his masterpieces. At the height of his career a stormy divorce necessitated his departure from Taos. After a brief period in New York, in 1936 Fechin moved to California at the invitation of the Los Angeles art dealer Earl Stendahl. Fechin’s canvases were in demand and his art school flourished. 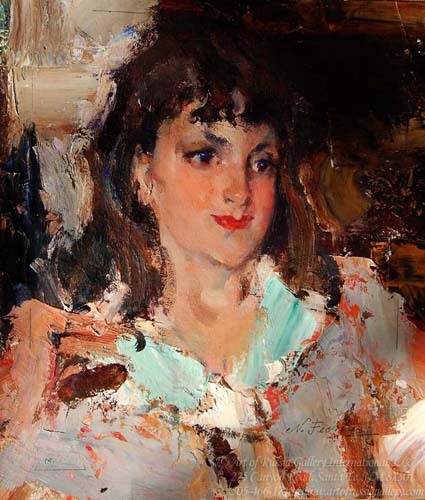 Bob Wagner in his magazine “Critic” wrote: “The first Nicolai Fechin canvas I ever saw nearly put me on my back—such color and brilliancy of technique!.. .what I saw convinces me that this Russian is one of the great artists of all time.” (Balcomb xiii). For over 10 years Fechin lived in a large house in the Hollywood Hills. In 1948, at the insistence of his daughter Eya, he bought a studio in Rustic Canyon in Santa Monica and continued painting and teaching small groups of students. He traveled to Mexico, Japan, the Pacific Islands of Java and Bali, which inspired new work. Fechin died at his home in Santa Monica in 1955. Shortly before, he was persuaded by his biggest collector and good friend, John Burnham, to have a simultaneous retrospective at the art museums in San Diego and La Jolla. The events were huge successes and a chance for Fechin to see canvases he had not seen for many years. Fechin was a superb technician who often used a palette knife to apply his oils. His forceful, dramatic, and brilliantly colored canvases with a high degree of modeling rank him among the giants in Russian-American art. Misleading information pervades on the internet that the Kazan School was founded by Nikolai Fechin’s grandfather. This is not true. Although Fechin did attend The Kazan School and it is now named after him, the school was established by Fechin’s father-in-law.